Eglantine; a rag doll whose vintage cotton sheet body has been dyed with caramel tea leaves - the kitchen smelled wonderful - with braided hair in 'Treacle Toffee' alpaca and silk yarn (I'm unashamedly addicted to this), kissable cheeks, a rose-sprigged Liberty print and a golden-winged embroidered fairy faintly reminiscent of the twelve good fairies who bestowed gifts at Sleeping Beauty's christening. Oh, and I mustn't forget her knitted shoes! I must have made at least three pairs in different coloured yarns before settling for her plumy rose ones. The talented doll-maker, Little Jenny Wren's pattern, which is free, may be found here. 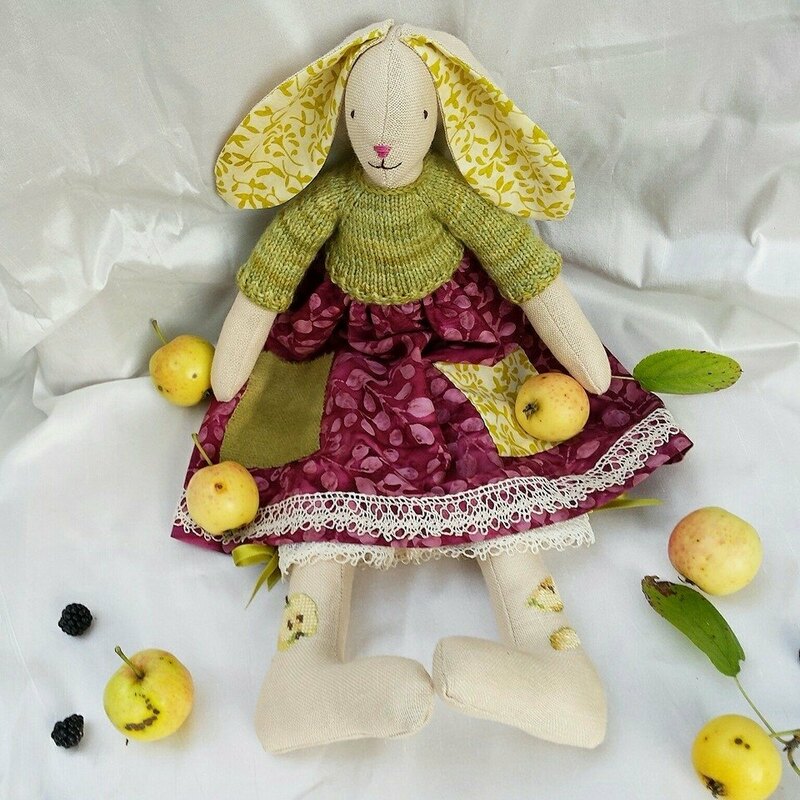 I love Jenny Marshall's dolls so very much and you too can fall for their undeniable charms on her Little Jenny Wren's Dolls Page on Pinterest. And my reading material for this rose-filled month of June is Elizabeth Jane Howard's The Light Years. "Sybil got up from bed and went to the open window; the air smelled warmly of honeysuckle and roses, there was the metallic sounds of blackbirds settling down for the night and the sky was turning apricot streaked with little molten feathery clouds. 'Look thy last on all things lovely, every hour,' came into her mind. 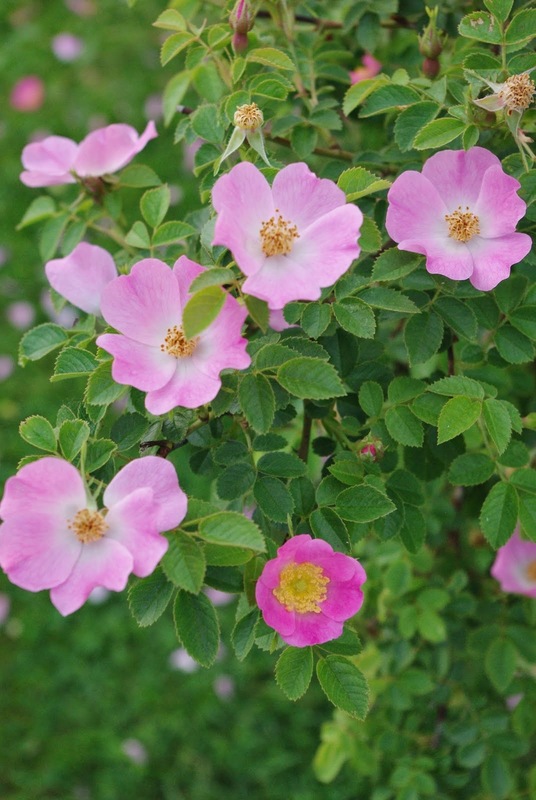 She leaned further out of the window and pulled a rose towards her to smell it. [...] She was thirty-eight, and the thought that it might be a very hard labour and that she might die recurred now. The petals of the rose began to drop; and when she let go of it, it swung back with only the stamens left." Elizabeth Jane Howard, The Light Years (Pan Books: London, 2013) p. 127. What a fascinating life Howard led, according to this obituary. A very good thing, perhaps, for I could not help but notice how many details in this, the first of four volumes of The Cazalet Chronicles, are of an autobiographical nature; smuggling into the pages the author's own version of Eden. Focusing on the pre-war years of 1937-38 Howard appeals to the childhood of many readers. There is so much more, of course. For those who are interested in the social context of the time the varying constrictions in the lives of middle-class women are sharply brought to modern light together with the reluctant obligations placed heavily on the shoulders of middle-class young men around whom everything seemed to revolve. Sweet nostalgia tempered with virulent depictions of inequality and suffering. I haven't finished reading The Light Years yet but I am grateful for the dose of English life, both in London and in the Sussex countryside, it has afforded me. Before I finally cut to the chase and announce the two giveaway winners, please wish Héloïse well for this coming week's Baccalauréat exams. She's had a few already but this week is going to be intense! Secondly, as I proudly announced over here last week, Tristan came top of all forty-five guitarists for his end of year exams. I had goosebumps when he played and the parents and children broke into applause right there in that exam room. He was, despite his stress, so very poised for a ten-year old. A joyful moment indeed for both mother and son. Truly, the best thing for me about these two giveaways has been the delight of reading kind-hearted comments left by readers I had not had the pleasure of 'meeting' before. Thank you to all of you for taking the time to write to me and for expressing your enthusiasm. I wish, somehow, I could make each one of you a winner. So, the winner of the Salley Mavor two art posters (offered and signed by the artist herself) and the book (a gift from me) is Jessica Stride. The winner of my Maytime Hare is Ali Thomson up in fair Scotland. Congratulations dear ladies! I look forward to receiving from each of you your full postal address via Facebook or email when you have a moment. I'll be back within the week as I have many exciting things to share with you. Now, if you don't mind, I have a Banoffee Cheesecake to bake for Father's Day tomorrow. I'm joining in with Laura's June version of The Year In Books. *Katherine Swift, The Morville Hours, p. 186.